Hi everyone! 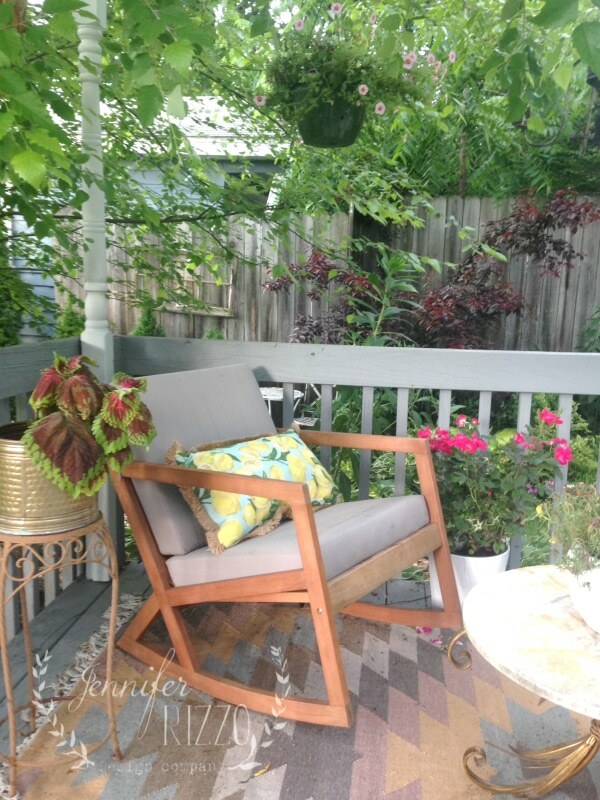 I am joining up again with some of my favorite bloggers to share our outdoor entertaining areas. I love being out in my backyard from the moment it’s over 60 degrees. Since our home is on the smaller side, it really ends up being another room of our house. 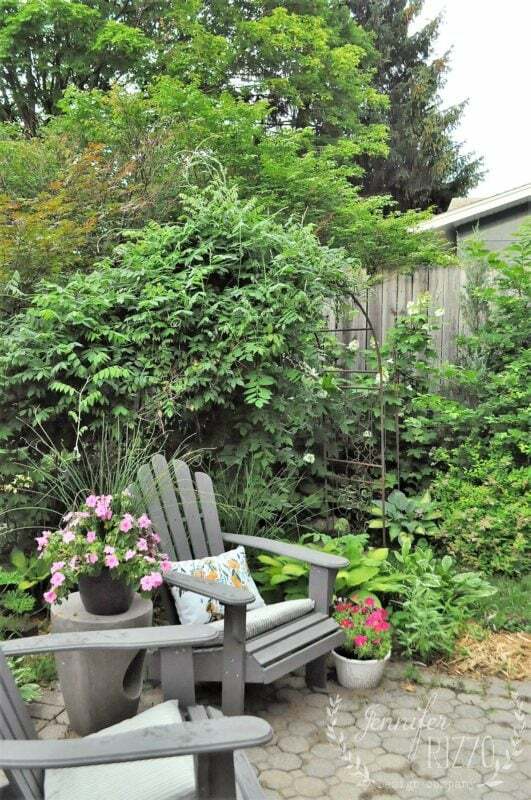 When I have downtime from the shop, I love sitting outside with a cup of coffee, and a good book. Last year, we painted our deck, and I am so happy we did! It enabled me to set up zones around our yard where people can hang out. Especially if we have a larger group for a party. I just finished getting the yard ready for a garden walk (You can see my farmhouse fence planter here.). 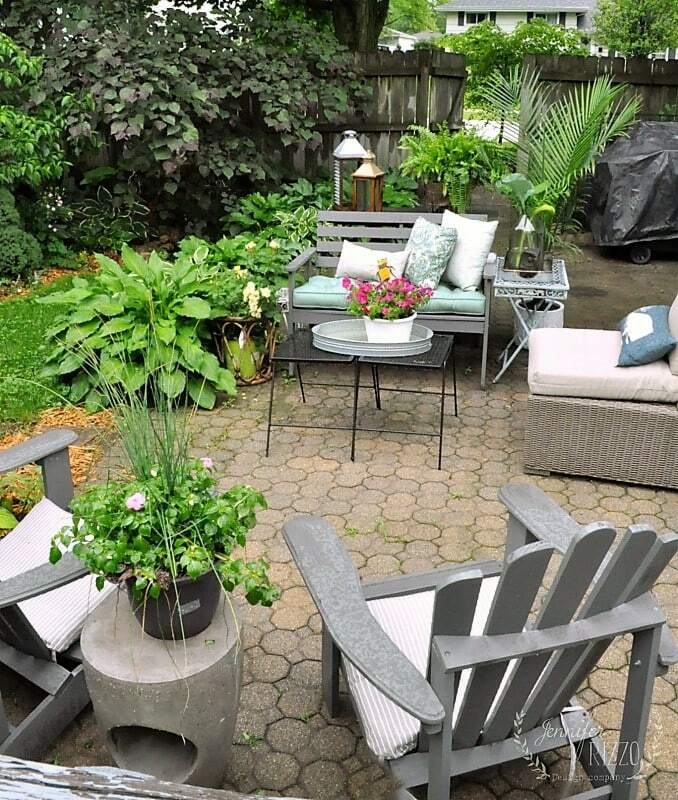 I feel designing an outdoor space is no different than an indoor one. It’s very important for me to make our outside just as comfortable as our inside, including beautiful pillows and plants. Furniture such as a coffee table doesn’t have to be made of plastic, or crazy expensive. 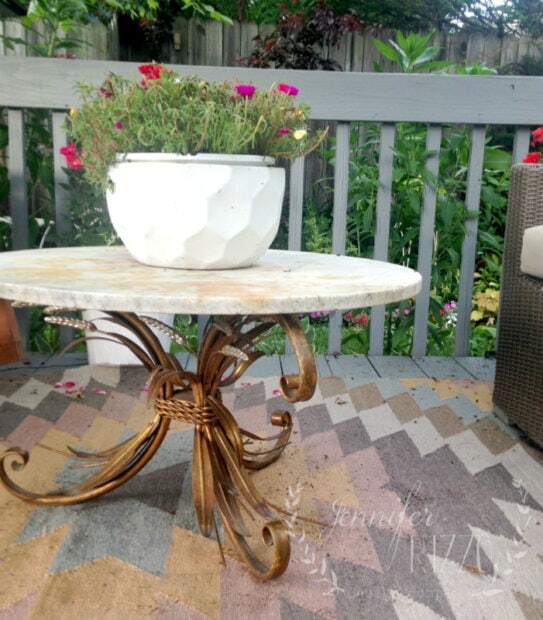 I found this metal base on Craigslist, and added it to a reclaimed marble top. It would work inside, just as well as outside. In my rule book, as long as it can withstand Chicago weather, it can go outside. It’s the perfect place for snacks and drinks. I had an indoor/outdoor rug as a way to soften our deck a little. Chairs can be functional, and comfortable. I love these rockers. They are a few years old already. The Adirondack chairs below are also super-comfy, and light enough to be moved around if needed. As second area near the grill is a great place to hang out when the chef is cooking, and to move too when the sun is too bright over another part of the yard. This brick patio is such a versatile area. You can see a fun girl’s night out party here, and other outdoor party ideas. My coffee table in this area is two inexpensive, $14 tables from Walmart, with a galvanized tray on top. Our vintage table ( was gifted to us, thanks Kate! ), is the perfect place to eat, or serve a buffet while everyone mingles. We added the posts and beams almost 6 years ago for my 40th birthday. It’s funny how times flies. 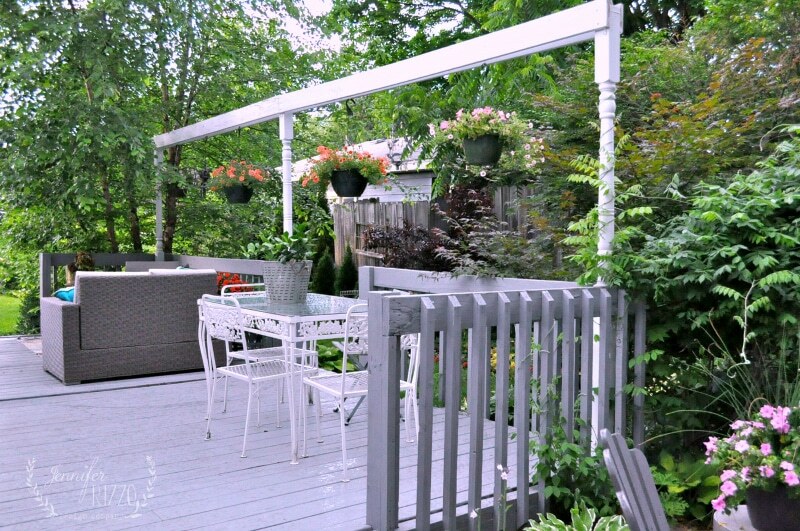 They make a nice statement and make the area feel enclosed, with out having the expense of a pergola. I love being able to have a place to put my hanging baskets as well. We have a few summer parties coming up between graduations, and communions. I’ll be praying for clear weather, and that it’s not too hot. That is the one thing. You can set up the perfect area outside, and then it pours! Though, I have been known to brave many parties in umbrellas! Our first housewarming party 18 years ago included flash flooding. Luckily, we were young, and served enough drinks, so no one minded the rain. The funny part was we called it “Fiesta del Sol.” Ha ha ha. Thank you so much for joining me on a tour of my outdoor entertaining areas! 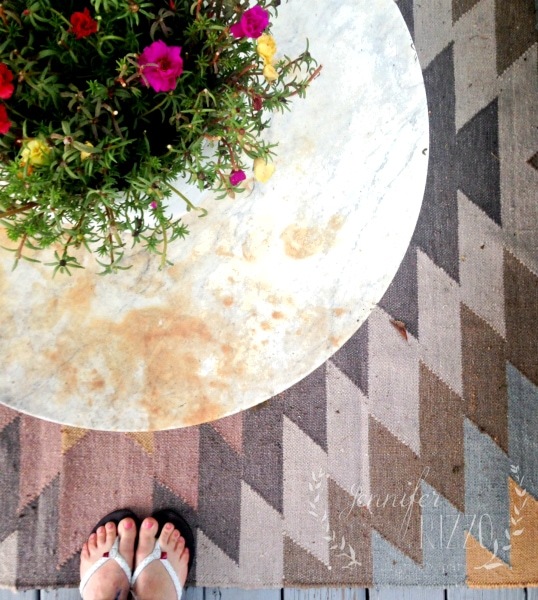 Make sure to visit the other bloggers to see their beautiful spaces! Love everything, Jen! 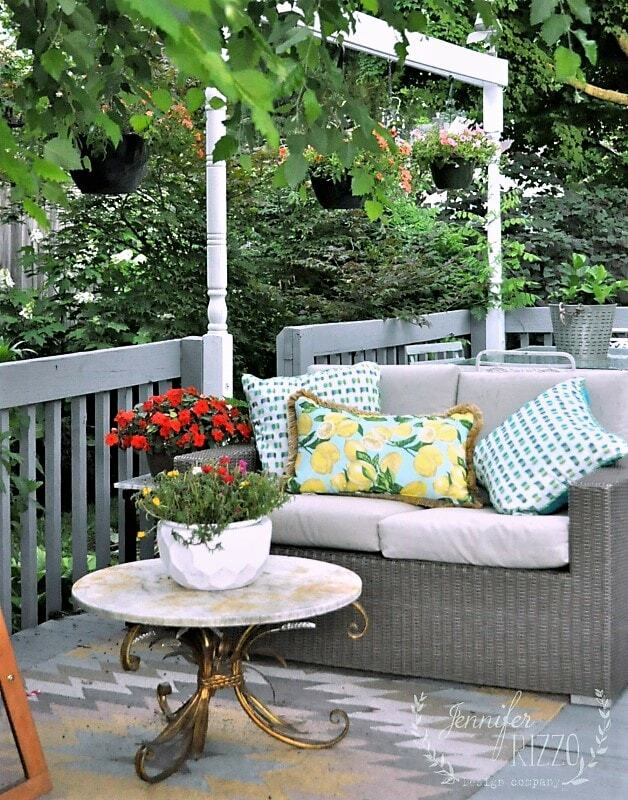 I like the way you have made the whole place like an outdoor living room. 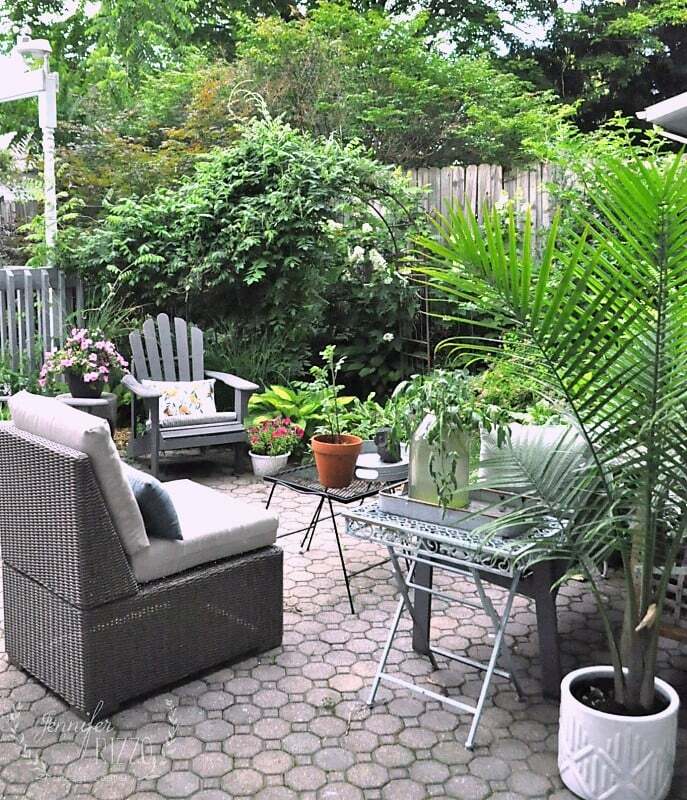 The potted palm is a great idea…we can always dream we’re in the tropics! 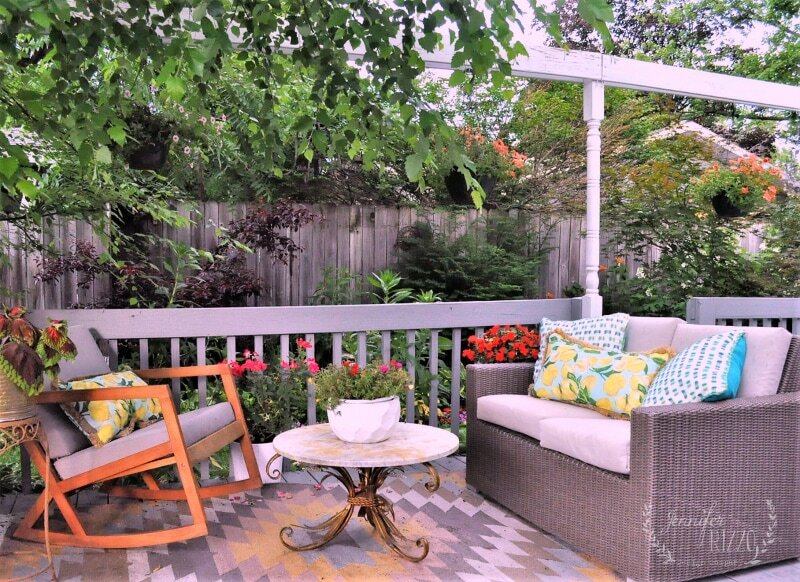 What a charming, cozy backyard space you’ve created! Thanks for sharing!